Happy Monday everyone! I wore this look for a night on the town with my hubby over the weekend. 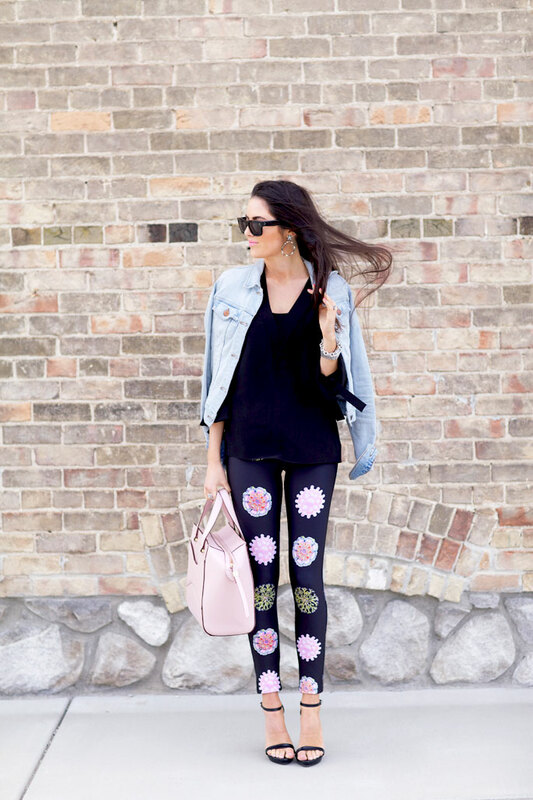 These printed leggings by Cynthia Rowley were the perfect springy touch to add to this outfit. I found myself not only dressing these leggings up over the weekend but also lounging around in them. They’re a scuba legging, which pretty much makes them the comfiest things ever (I’m literally wearing them as I type this post ;). To see more from the Cynthia Rowley Spring 2014 Collection, watch the video below. woow! haha they are so cute. Those are the cutest leggings! I need to get myself some scuba gear… I’ve been seeing the material everywhere! These leggings are so fun. Love this, girly! What a funky way to incorporate some spring color! Your clothes are so tight and revealing these days…Not the modest fashionista you once were! Wearing tights as pants is not cool! It screams inappropriate! Married 20 something cannot get away wearing clothes that arent suitable even for a 9 year old! hahahahahaha this must be a joke comment right. Chic outfit! Great bag and shoes! Cute denim jacket and bag. These leggings look great on someone young, tall and slim like yourself! ah! these leggings are captivating! You look gorgeous!!! I love those pants! Cynthia Rowley has really nice stuff!! Those leggings are awesome! What fun floral print!! those leggings are so cute!! and perfect for spring! Love the pastel pink Kate Spade bag and the Cynthia Rowley collection looks fab! Such a fun way to dress for Spring! Love the look. You are no longer the modest fashionista you used to be. Your looks are becoming more and more revealing. Wearing tights as pants is NOT cool! love the bag though! Emma, these are not tights. They’re a thick legging. I consider myself very modest. Love the purse. Gorgeous colour!!!! You look lovely! Specially the bag and shoes, and legging is really pretty as well! Those are seriously the ugliest things I’ve ever seen. Sorry. Love printed pants these days! Such a fun and unexpected look! Really love those leggings!! 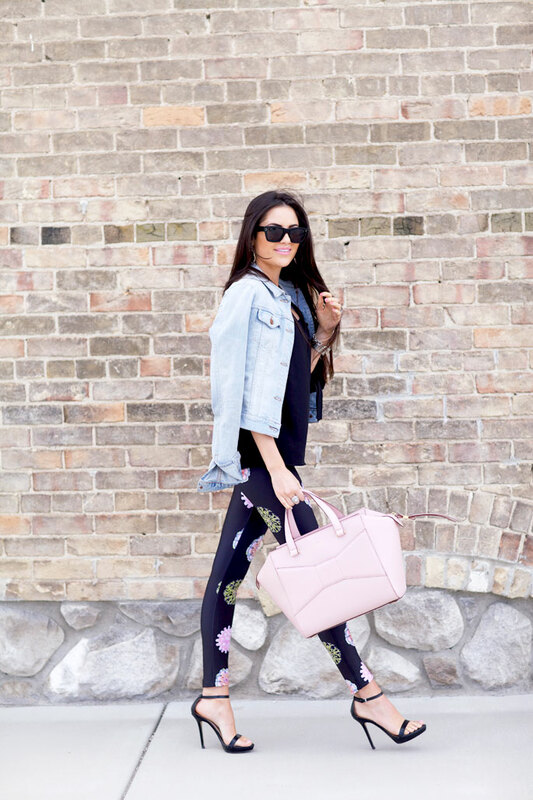 These leggings take the cake on whimsical spring inspiration! How fun and how adorable! And I love the perfect match with your bag! Such an adorable look! Great video. I love how Cynthia Rowley designs. I have a couple of her pieces in my closet. Can’t wait to get something from her collection for the spring. i really like the color of your beau bag — blush is my favorite during this transition to spring. LOVE this pink purse!! Super springy and fresh. Loving those heels and that purse paired together! This is such an adorably fabulous outfit! Great bag, too! Wow, those leggings are so cool! Very cool Spring look. Such a fun outfit…love the pumps! Lovely leggings! They realy look cozy! Such cute pants! Perfect look for spring! That bag and those leggings go perfectly! How fun are those leggings? Love them! Those leggings are such a great find! I absolutely adore the third picture. Love the mix of pastels and dark pants. Such cool leggings! definitely something different than you usually wear. Love it. This such a great way to style printed pants! You have inspired me to pull mine out of the closet and rock them this spring! Thanks Rach! Wow, these leggings are so unique & fun! Leggings have been my go to look over the last several years and love how they have evolved through prints & different materials! I am definitely one that loves the comfy side of chic!! That Kate Spade bag & your lip colour are the most gorgeous shade of pale pink!! Obsessed with these pants! I love that you paired it with a soft pink bag! I am swooning over those leggings! And of course the beau bag is gorgeous! Love Cynthia Rowley!! And the leggings are AWESOME! My jaw dropped when I saw the picture on Instagram! Amazing! These are truly amazing shoes!! I have to have them. Hi Rachel, where are those shoes from? I’m looking for something exactly like that! Such a fun transition into spring outfit!! I definitely couldn’t pull those leggings off but your long legs look great in them! I am just highly satisfied with your writing skills since nicely like with the dwelling in your web site. Is your compensated matter and also do you change the idea by yourself? In any event . keep up the nice good quality producing, it’s rare to appear a good site just like it currently. Wow, someone whose writing skills are slightly worse than Rachel’s. So cute!! Love love love the leggings!! I am loving the scuba material for dresses and leggings these days! And so glad denim jackets are back! We’re doing a post this week with our favorite denim jacket too! Those pants are seriously fun! Gorgeous pants. You are totally rocking this look!